Our methodology facilitates consistent, high quality development and represents software best practices focused on the development life cycle which fosters repeatable results, knowledge transfer, increased productivity, and highly integrated working relationships. 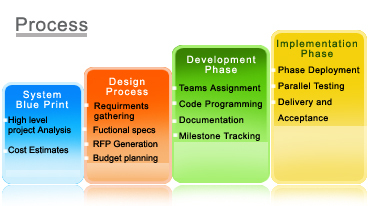 Our methodology supports a full range of services including assessment, planning and design, and implementation. Through systematic analysis of the client's business requirements iAntz develops a detailed understanding of corresponding functional requirements and translates those into technically feasible functional features. Prior to actual coding iAntz develops an overall architecture of the product and identifies individual modular components as well as existing iAntz tools and third party tools that will be utilized. For each component, a set of interfaces is defined. This approach reduces the overall development time, minimizes the integration process and improves the testability of the product. iAntz recognizes that the way users interact with the system is just as important as the system's functionality itself. iAntz's Graphic Designers and Engineers develop interface prototypes and enhance them jointly with the client and, when appropriate, with representative end-users in order to insure the most straightforward and intuitive user experience. iAntz believes that in order to successfully accomplish the project, the intermediate milestones have to be delivered in a timely fashion, while incorporating client feedback. iAntz tracks each milestone as a full-fledged delivery with all the implications of adherence to specifications and requirements. In our experience, a small team of senior and talented professionals delivers faster and better projects than larger teams of inexperienced developers. If the project cannot be delivered in the timeframe allotted with a single team, iAntz's architect and project manager will divide the project into sub-projects and define the strict programming interfaces between them. QA at iAntz starts with the commencement of the project, not at the code freeze date. QA engineers participate in the product's design in order to insure testability of the final product by conducting unit testing and integration testing in accordance with an overall QA Plan and utilize both manual-testing and automated test tools if needed. iAntz provides training and documentation for its clients to be able to support, maintain, and enhance iAntz-developed products to the degree desired by the customer. iAntz continuously conduct training sessions to enhance Tech Support of workers, System Administrators, and Software Developers on customer sites and on iAntz's premises. iAntz's products are "Built for Change" as we are well aware that the need to enhance a Web solution usually arises even before the solution is out of the gate. To the degree desired by the Client, iAntz enhances the product in a long-term relationship. iAntz considers every client a partner. From the earliest stages, clients are closely involved into the process of technical definition, development and tests of the products.